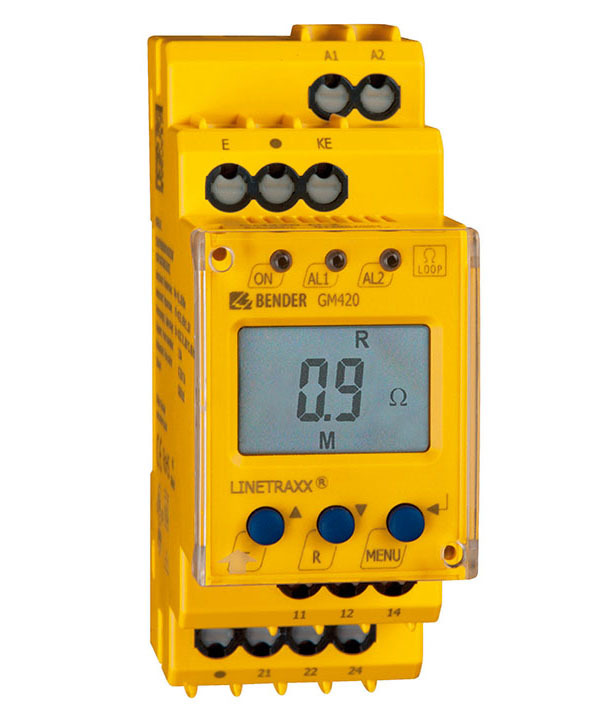 The GM420 series loop monitor is designed to monitor the resistance of PE conductor connections in AC systems and in de-energized systems. The extraneous voltage Uf between the terminals E and KE must not exceed AC 12 V. The ohmic resistance of the conductor loop and the AC extraneous voltage Uf, if existing, will be indicated on the display. The currently measured value is continuously indicated on the LC display. If the measured resistance value increases above the set response value, the alarm will be activated and stored. Adjustable time delays allow installation-specific requirements to be considered.